It's Friday, and I've got an Indie to show y'all!! Black and White glitter seems to be getting around quite a lot lately, so I'm really happy to show y'all this one. When Rockstar Nail on Etsy said she would send me a polish to review, I wasn't expecting this one, but when I got it and saw that it was black and white with a little bit of pink in it, I was like YES, Mama Likes! I Know this is not your traditional polish bottle shape, but fear not, there's a brush in it. Lol. For my swatches, I layered it over Sinful Color - Ocean. I wanted something that will show all of the colors in Punk Rock Barbie. Application was nice with this, But I can't tell you how many coats this is, as I had to apply this using the "dabbing" method. I didn't have to fish for glitters, but I found that dabbing worked best. I then decided to use the same dabbing method to apply the polish on my nails without a base color. This polish wasn't meant to be worn alone, as all others that might look like it. It's a glitter topcoat that can be worn over so many colors! I LOVE THAT! BUT As you can see, if you want to wear this alone, you'll have to use quite a number of your polish. Lol... The dabbing method works to cover all spots so you don't leave naked nails visible underneath, like on my ring finger in the picture above. I Love the Extra pink in the Black and White glitter we happen to see so much lately. Everything appears fine with the polish and the smell is just like regular polish. Not offensive. TOPCOAT is necessary as glitters like this tend to dry gritty. I wish though that it had a bit more base/liquid in it, so I didn't need to "dab" to apply. But again, the dabbing method is actually kind of a blessing. Less dry time, and more precise application. Late Night Update: I discussed this with Erika - The creative mind behind Rockstar Nails, and she assured me that she's fixing that issue. I LOVE when businesses take the recommendation of reviewers. Yet another seller quality I Love! If you're interested in this or other polishes by Rockstar Nails, Please Click Here to check out her Etsy Store. Please Note, this particular polish is new and is not yet in her store, but she has others available for purchase. This will be in her store, so stay in touch via facebook. Anyone who buys from her will get a Toe Separator in their orders while supplies last. 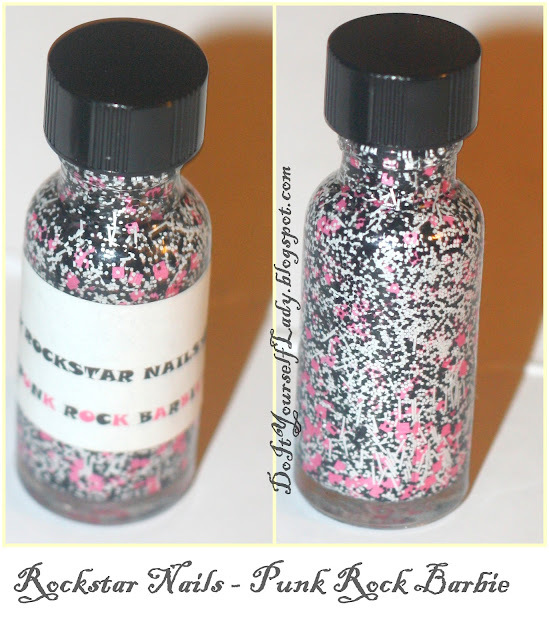 These come in Various colors and can be viewed on Rockstar Nails Facebook Page. Are you loving the black and white glitter polishes around lately too? its sooo pretty, I love it! I'm sure Erika will be glad to read this. She did fabulous on the polish. That's one glitter I wont mind having! Like her facebook page to stay in touch to know when she stocks it in her store. That's what I thought too. It wasn't "too much" in person at all. Just enough "wow factor". Love this! I wish I could deal with glitter polishes though =( I'm so over the impossible to take offness/ruining my nails with acetone. Oh well, I'll just stare at your lovely pics! That's why I put a coat of some "meh Top coat" over my glitters, wait like 2-5 minutes, and use my fingers to peel off the polishes. Lol.. This is so cool and girly - Punk Rock Barbie is the perfect name! Looks so great over that base colour! I love it with the green. The pink is a nice pop of different for this glitter!